Most of us don't like to be judged harshly and would rather not know about someone's negative opinion. But if someone has a legal judgment against you, that's an entirely different matter and falls into the need-to-know category. A judgment is an order of the court that impacts your rights. You have a very brief period of time to ask for relief from the judgment or to file an appeal, so it's important to know about it as soon as possible. Find out if a court has entered a judgment against you by asking the clerk of the court, consulting your credit reports or doing an online search. What Is a Court Judgment? In other eras, differences were resolved by brute force, duels or shoot-outs. Today, the judicial system is the way that a person who feels wronged by a business or a neighbor can settle the matter without resorting to physical confrontations. She files a complaint or petition in the appropriate court setting out her claims. Then a copy is served on the other party, and the judge, with or without a jury, issues a decision. The official written version of that decision is termed a court judgment. Once a judgment has been entered against you, you have only a very limited time to ask the court to reconsider the judgment, relieve you from a default judgment or take an appeal to a higher court. When that time passes, the party who has won the case can take action to enforce the judgment. 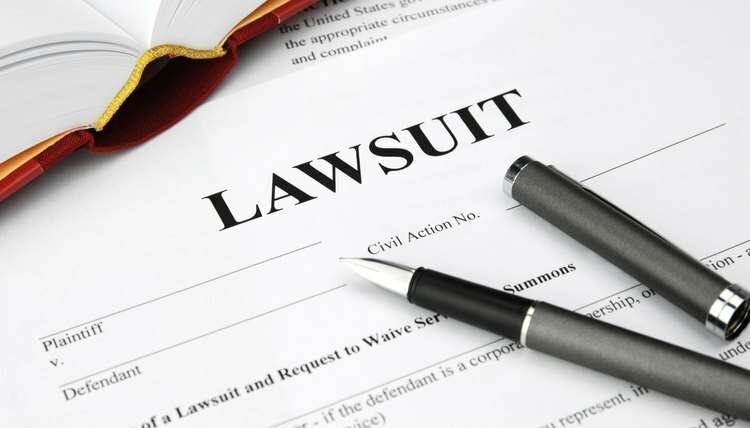 Generally, you will know if someone sues you long before a judgment is issued against you. That's because it is a legal requirement that the person bringing a complaint against you must arrange to have a copy of the legal documents served on you. This usually means that the papers are handed to you personally by someone who is not a party to the lawsuit, although the court can approve other means of serving the papers. The court waits until an affidavit is filed in court saying that the papers were legally served on you before taking any further action in the case that might lead to a judgment against you. But if the papers are served on you, and you fail to respond, the other party can ask the court for a default judgment against you. If you are wondering if a court entered a civil judgment against you, it isn't that hard to find out. First, if you received notice of a lawsuit and you just ignored it, you can call the court where the case was filed. Give the clerk the case number listed on the documents and ask if a judgment has been entered. Might there be a judgment against you in a case you aren't aware of? There may be. You can learn about it by receiving a letter in the mail or getting a phone call from a collection agency; a notice that your bank account has been frozen; a judgment lien filed on your real property; a notation on your credit report or a garnishment notice from your place of employment. In any of these cases, the communication will provide you with information about where to call to learn about the judgment. If none of these things have happened, yet you suspect that there is a judgment against you, you can check in a number of ways. A money judgment will almost certainly show up on your credit report – there are three primary credit reporting agencies, Experian, TransUnion and Equifax. You are entitled to obtain a free credit report from each of these companies once a year, so that's a good place to start. Finally, don't forget that court files are public records. If you have some idea where the judgment might have been entered, contact that court and ask, or see if the court has its records available online, searchable by name. Plus, many counties prepare lists of judgments that can be accessed by the public, sometimes online. There are also private companies that provide online judgment searches of public records, sometimes charging fees. Family Law Headquarters: What Is a Default Judgment? Spengler, Teo. "How to Find Out If I Have Any Judgments Against Me." , https://legalbeagle.com/5783312-out-judgements-against.html. 04 December 2018.